Sometimes the problem to be solved is that we need to have more joy and silliness in our lives. A little while ago Bart mentioned an app he’d heard Mikah Sargent of iMore talk about, called Rocket, and it’s my new favorite app. In the words of the great early podcaster, Tim Verpoorten, it’s a menubar app that does one thing, and does it well. All the cool kids use these fancy emoji in their writing. I can pretty much pull off a winky face but I get there by typing a semi-colon, then a dash, and then a right parenthesis, which technically is an emoticon, not an emoji. Other people, like my nutter of a neighbor Rick, are throwing in martini glasses and party hats and sailboats. I wanted this kind of joy too. On iOS, the keyboard will offer you emoji if you type the right word. I use it a lot and it makes me happy. But on the Mac, where I do most of my typing, I wanted that joy. Enter Rocket, from matthewpalmer.net/…. Rocket is a freemium menubar app that makes it dead simple to insert emoji wherever you can type. Once installed, simply type a colon, and follow it by the word you want to represent. For example, type : and rocket and you get a choice of a female astronaut ‍, a male astronaut ‍ (who looks suspiciously like Commander Hatfield depending on your operating system and browser), or a rocket . Now I’m old enough that I have to control-zoom to tell which one is which, but isn’t that cool? One of the fun things about emoji is how much more inclusive they are lately. 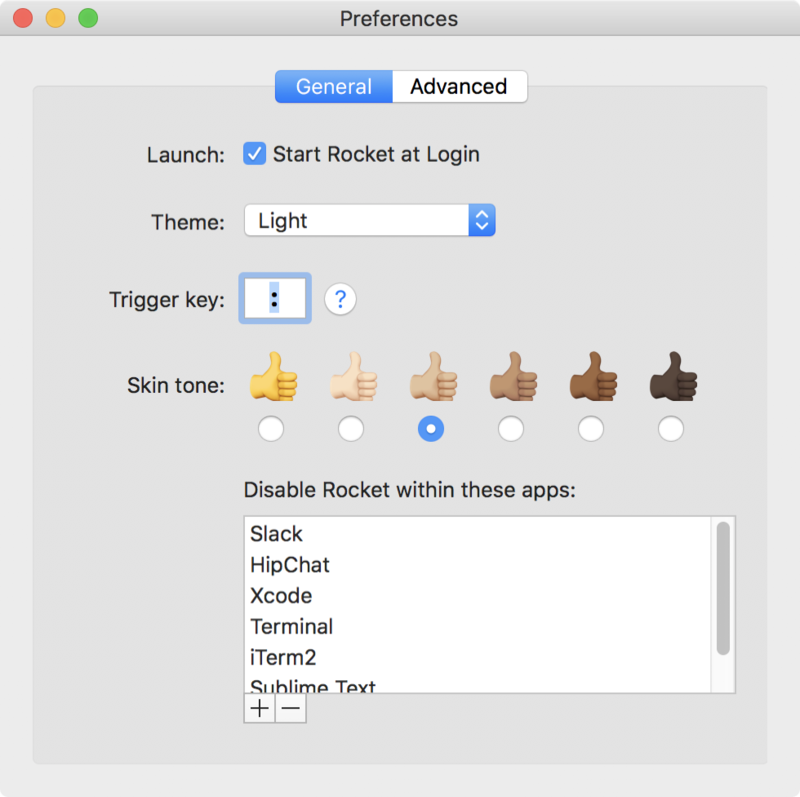 Rocket lets you choose your skin color in the Preferences pane so you don’t have to select it every time you insert an emoji. Rocket also lets you disable itself in certain apps. It’s preloaded in apps like Slack, HipChat, and Terminal. The first two are in the category of things that already have emoji built in and the third being apps in which you don’t want emoji. If you’re starting to use emoji on the web, you can disable on certain websites too. For such a simple app, it surprisingly has preferences. You can choose to have Rocket start at login (duh), you can change the trigger key from colon to other single punctuation marks. Matthew, the developer, suggests that colon, left parentheses, and plus work best. I’ll leave it at colon. Once you get addicted, you’ll realize that you’re not getting to see all the emoji available. For example, :martini doesn’t find the martini glass that Rick keeps sending me. Alas, it’s time to pony up $5 to get the full capability of Rocket. Not only do you get the full emoji search, you can use shortcuts and descriptions to find them. 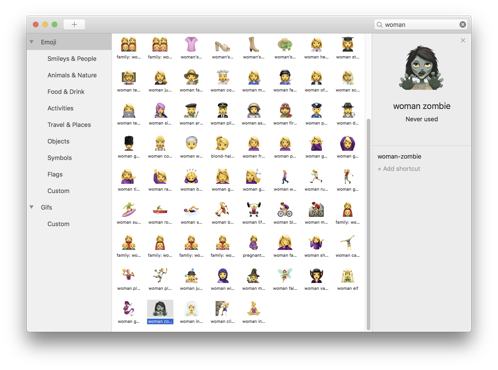 You also get GIFS and stickers because life isn’t silly enough, and multi-emoji shortcuts. I don’t know what those are but I need them!. Because I’m a team player, I paid the $4.99 to go pro on Rocket. Now I can type  and like the big kids! I can assign my own shortcuts. I just created a combo shortcut – if I type colon and four asterisks, I get ! I bet you’re really excited I can do this now. As promised, after shelling out my hard-earned hoonyackers, I got an email with a link to download custom GIFs. Not really sure I’ll use them since I pretty much hate animated GIFs. It’s not that they’re not often clever. The reason I dislike them is that people send them in chat and then until they scroll away they’re moving in my peripheral vision which drives me bonkers. One of the reasons I love Telegram is that I can delete animated GIFs on my side and the person who sent them never knows. So I downloaded the 150 animated GIFs! 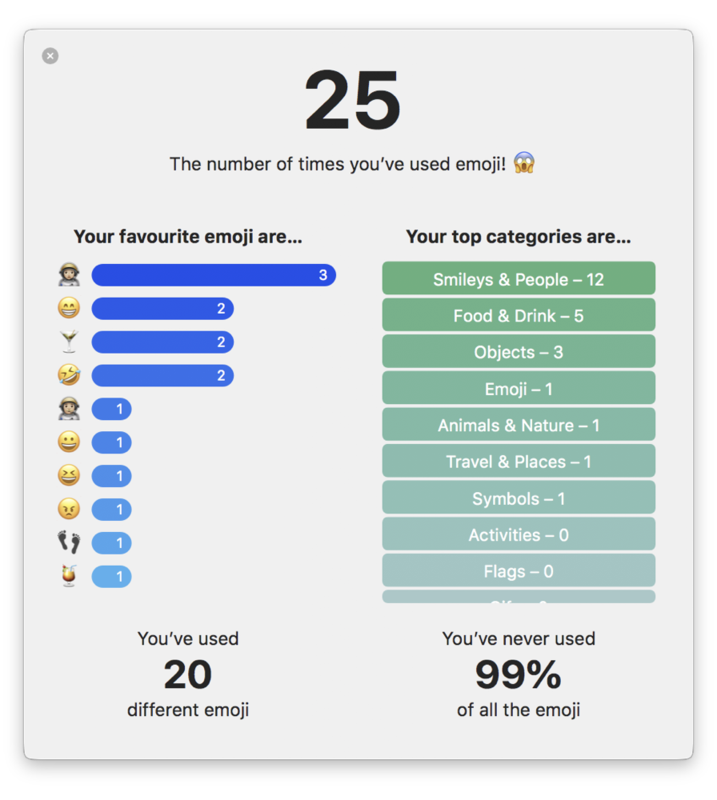 Also with the $4.99 you get to see your statistics on what emoji you use the most often. So far I’ve used 20 different emoji and haven’t used 99% of those available. Look out world, I’m about to become really annoying!